I am responsible for taking action, asking questions, getting answers and making decisions. I won’t wait for someone to tell me. If I need to know, I’m responsible for asking. I have no right to be offended that I didn’t “get this sooner.” If I’m doing something others should know about, I’m responsible for telling them. It is their commitment to “learning as fast as the world is changing.” As WD-40 CEO Garry Ridge said, “The fear of failure is the biggest fear in the world. 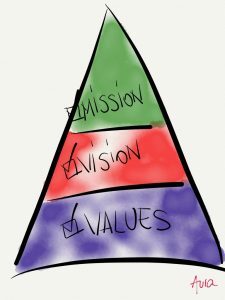 We had to go from failure to freedom.” Now that core values are mainstream, how can nonprofits use them to ensure they attract the right employees and create a culture that supports their combined vision-mission-values? We have developed an easy and fun 5-step process with our clients and would love to hear what you discover as you develop (or refine) your organization’s core values. Step 1: Crowdsource – Have employees create a values board (similar to a personal vision board). Make it a game in which each employee collects quotes, pictures and values that resonate with them. Post the collection on a bulletin board or in a common room so that individuals can review and comment (have Post-it notes and markers available). Step 2: Deliberate – Convene employees during a staff meeting or retreat (with food!) and have them present their ideas for discussion. Have a good facilitator (not the CEO) guide the conversation and start collecting themes. The goal is to gather common ideas, not fine-tune or wordsmith. Give each employee stickers (dots) to vote on the top 5 themes that most connect to them and the organization. Step 3: Refine & Finalize – Ask for volunteers to use the current vision/mission, values board, discussion notes and votes to knit together a final draft for further discussion or voting. You may want to share this with your board of directors during a board meeting. Step 5: Monitor & Evaluate – Add core values to your annual employee survey and ask their opinion on how well they feel the organization is living its values. Ideally, 90 percent of employees are satisfied with the values and believe the organization is effective in upholding them. If not, go back to Step 4 and find ways to embed them in a more consistent manner. As restauranteur and business author Danny Meyer so eloquently suggests, core values are “the riverbanks that help guide us as we refine and improve on performance and excellence. A lack of riverbanks creates estuaries and cloudy waters that are confusing to navigate. I want a crystal-clear, swiftly flowing stream.” We would love your input on your core values, how you are using them to drive performance and excellence, and we welcome comments and ideas about our 5-step process.